Dr. Ross was diagnosed with ALS in April 2017, and in August 2018 he decided his ALS was bad enough that he needed around-the-clock care. He moved out of a house and into an apartment in Chapel Hill, N.C. Andrew now receives care mostly from Lora, employed by HomeWatch Caregivers. His ALS has been described by doctors as “especially aggressive”, but Dr. Ross has a very positive attitude. On Oct. 9, 2018, Lora Bradley helps Dr. Andrew Ross walk across his apartment in downtown Chapel Hill, NC. Dr. Ross was diagnosed with ALS in April 2017, and in August 2018 he decided that his ALS was bad enough that he needed around-the-clock care. Andrew now receives care mostly from Lora, employed by HomeWatch Caregivers, and due to the debilitating nature of ALS and the amount of time they spend together, Bradley and Dr. Ross have a very intimate relationship. Dr. Ross keeps this ALS band on his wheelchair as a reminder to just take his life day-by-day. The average life expectancy for people living with ALS is three to five years, but Dr. Ross’s is especially aggressive and progressing more quickly. Bradley often transports Ross in a big body sling when he is not strong enough to walk. He uses the sling in order to use the restroom and be lifted into his bed at night. Irene Zhu, a UNC Chapel Hill senior planning on going to school to be a physician’s assistant, walks with Dr. Ross through the floors of his apartment complex on the evening of Oct. 25. On every floor of the apartment, the walls are filled with original art donated by residents of the building, forming a sort of gallery. Before being diagnosed with ALS, Dr. Ross was a photography professor at Radford University in Virginia, and still thoroughly appreciates art. Most weeks, Dr. Ross receives new technology to cope with his ALS, which is why Rebecca West dropped by the apartment with a new breathing machine. Lora Bradley sasses Dr. Ross while West jokes about death. Bradley helps Dr. Ross shower every other day. Andrew Ross talks to his mother, Mary, about her recent visit with Andrew’s father on Andrew’s behalf to Radford University. Andrew felt too sick that day so didn’t go. Mary Ross shows Andrew a past photo they all took at the university together, and Dr. Ross tells his mother about the people she spent time with this time around. Mary Ross has Alzheimer’s and doesn’t remember the people she met, so Dr. Ross is very patient with her. Mary Ross does her best to entertain her son by rubbing his feet during his monthly ALS check-up at the Duke ALS Center in on Nov. 8. She can’t do a lot for him, but still dotes on him a lot. Mary Ross and her husband John look on concerned as a doctor attempts to figure out why Dr. Ross has been coughing so uncontrollably in the last week. Dr. Ross doesn’t believe that his lungs are getting weaker or that his ALS is the reason he is coughing, but the doctors say that it is. Dr. Ross goes to bed at the end of the day with oxygen to help him breathe more easily and comfortably. Judy Hogan is an 81-year-old environmental activist, writer, and teacher. 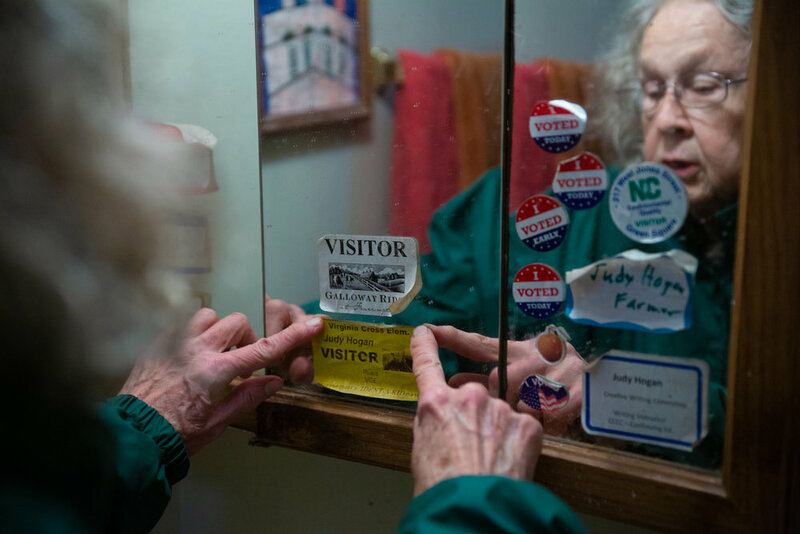 Since the 1960s, she has fought a myriad of different environmental justice issues affecting her community in Chatham County, N.C. Right now, she is leading a fight against Duke Energy dumping coal ash in her town. She publishes books and poetry and teaches writing classes twice a week. This series of photos was for a final project for my Photo Stories class. It is accompanied by selected poems from Hogan’s most recently published book, called “Shadows”, which is autobiographical about her daily life. I took a more free-form, artistic approach with this caption style because I want Judy Hogan to speak for herself. things that it simply won’t let go." - From Judy Hogan's original poem book "Shadows"
friends are rare. She’s a bird-watcher. toward her, both smiling, she says,"
- From Judy Hogan's original poetry book "Shadows"
by my age. Still, I rake and dig. medicine worse than the complaint. My body heals while I sleep. them I have good telemeres. lucky grab bag. I can’t complain." poetry. “What is a poem?” I asked. throw up words we weren’t expecting. and they all did, even the librarian. was quieted. Another unexpected gift." "Some see the world as a dangerous place. intuition, even when it doesn’t make sense. to be my enemy, I stay away from them. harmed, but this way to live suits me." attention, all will be well." - From Judy Hogan's original poetry book, "Shadows"
go too long without eating and sleep early. As the day waxes, my confidence returns. of stories and insights alive behind me. Among others I see their discomfort. stayed away, and generally, they did, too. me continue my independent way. but harvested bushels of tomatoes. I made spaghetti sauce and soup. teach poetry and story writing. my own life of work and love." we couldn’t pass. I wanted more work. but there is still more to tell. I will." gratitude and let it go to work." to be elected president, is killing us off. Andrew says, “You’ve won a victory. body then is truly sick, won’t fight any more. Milosz lived under the Nazis, under Stalin. can conquer. Give it a try." "Even love has its misunderstandings. Sometimes my son and I knock heads. view, her own life story, fears, and dread. the exultant eagles join the circling vultures. returns, we are constrained to work free. which means some more slowly than others. living a benign life as a freedom-fighter. cherish poetry, and love my homemade bread. after I’m gone. She’ll be okay." Anita Earls has been a civil rights attorney mostly in North Carolina for the last 30 years. She grew up in a mixed race family in a time where interracial marriages were illegal. She founded the Southern Coalition for Social Justice 11 years ago, and is now running to be the hundredth justice of the North Carolina Supreme Court. On the evening of Sunday, Nov. 4, sits in the pews of Union Baptist Church in Durham, N.C among fellow N.C. democratic candidates. The Durham Committee on the Affairs of Black People invited democratic candidates they endorsed to each speak on their platforms for one minute. Anita Earls has been a civil rights attorney mostly in North Carolina for the last 30 years. She founded the Southern Coalition for Social Justice 11 years ago, and is now running to be the hundredth justice of the North Carolina Supreme Court. A pile of abandoned voting day materials advocating for Anita Earls lays abandoned on a table at the North Carolina Democratic Party headquarters in Raleigh on election night Nov. 8. On election day, Nov. 6, Earls sits alone in front of a food table before her “war room” party at a hotel in downtown Raleigh. The rest of her campaign staff are taking up the rest of the chairs in the suite doing work. Anita Earls nervously watches the results from other state races come in on the television on election night, waiting for her own race to be called. After Justice Barbara Jackson, Earls’ leading opponent called her and conceded, Earls, Caroline Spencer, and José Morales scream in celebration in their hotel “war room” in Raleigh, N.C.
“This is a moment I will never forget,” says Caroline Spencer, Earls’ campaign manager. At the North Carolina Democratic Party headquarters in Raleigh, Earls is met with a vivacious crowd of supporters after her victory is announced as the 100th justice of the North Carolina Supreme Court. Anita Earls takes the stage at the North Carolina Democratic Party headquarters as her supporters cheer below. Juju Holton and Caroline Spencer, who both worked on the campaign, shed tears and celebrate behind her. (From left to right) Back at the hotel room in Raleigh, Jackie Gonzalez, José Morales, Anita Earls and Juju Holton celebrate Earls’ victory on election night. Even after midnight on election night, Anita Earls doesn’t relax, despite her victory. She continues researching how undeclared races are being counted while she drinks champagne. “In the words of Nelson Mandela, ‘After climbing a great hill, one only finds that there are many more hills to climb,’” Earls maintains. Steve Watkins, one of the longest-tenured flight instructors in the U.S., owns his own tiny flight instructing company called Watkins Aviation in Person County, N.C. He has clocked over 9,000 hours flight instructing – one of about one hundred in the country with this accomplishment. This is a story about Watkins and a hurricane that blew through. On Wednesday, Sept. 12, 2018, Steven Watkins, one of the longest-tenured flight instructors in the U.S., flies above Person County, N.C. He has clocked over 9,000 hours flight instructing – one of about one hundred in the country with this kind of accomplishment. Watkins owns his own tiny flight instructing company, called Watkins Aviation, of which he is the sole instructor, and operates out of Person County Airport in Timberlake, N.C. In preparation for Hurricane Florence hitting the east coast, Watkins flies one of his planes back from South Boston, V.A. Watkins and his partner in the plane’s ownership, Carl Chambers, push the plane inside the hangar so that it doesn’t get damaged due to sporadic hurricane storming. Watson changes the fuel on the plane he uses the most for instruction, a Cessna 150. On Thursday, Sept. 13, Watson warily watches the weather forecast as Hurricane Florence is predicted to hit the N.C. coast hard. Watson watches the weather outside when his daughter Carey Anne comes to visit. Once he cancelled his flight students due to the hurricane, Watson spent a lot of time sitting in the airplane hangar building a plane for his daughter. On Friday, Sept. 14, Watkins parks himself in the airplane hangar for the day while Hurricane Florence dumps rain outside. He tries for hours to fix a shattered work light. By the time Saturday, Sept. 22 rolls around, Steve Watkins is in the swing of giving flight lessons again after Hurricane Florence passes. On this day he is teaching Douglas Appleton, who is training to get his private pilot’s license.